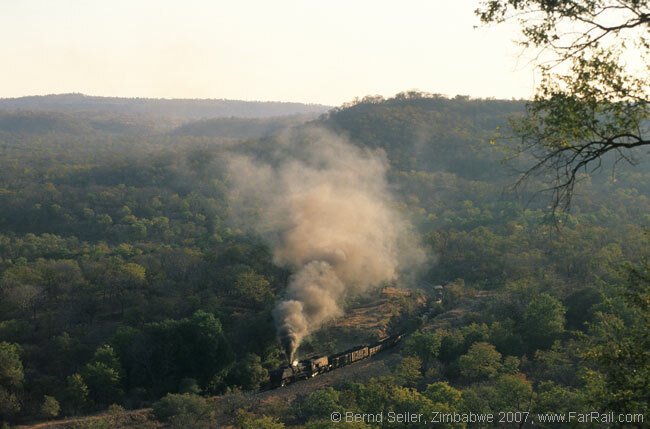 Our trip will combine exciting steam photography, based on chartered freight trains, with wildlife and the wonders of African scenery. 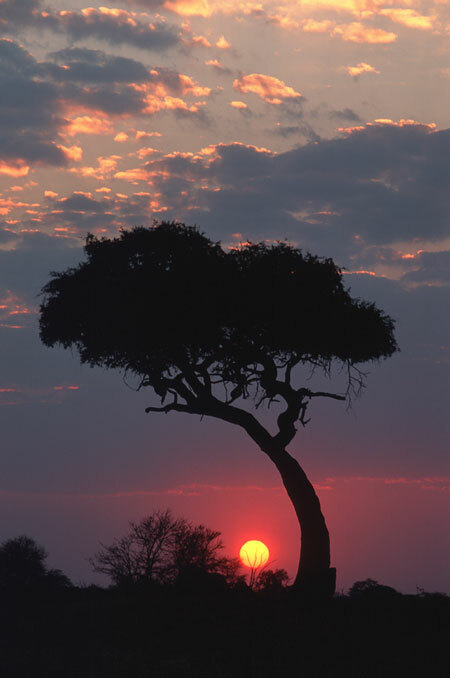 Zimbabwe is a beautiful country with fascinating wildlife and scenery. The spectacular Victoria Falls, known as “the smoke that thunders,” is one of the absolute musts when travelling to Africa. Friendly, welcoming people and their warm hospitality make a stay in Zimbabwe pleasant in all respects. 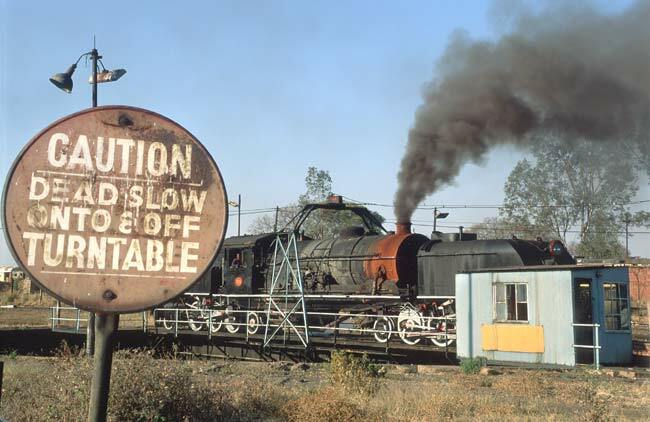 Last but certainly not least, Zimbabwe offers the last commercial steam working on the African continent  one Garratt in Hwange. We’ll visit it all, the sights of the country, the wildlife, as well as the “elephants on rails”, the last mighty Garratts in regular service in the world. The Garratts that we will see are among the largest working British steam locos (Beyer-Peacock) anywhere. We strongly recommend that you do not delay in seeing these wonderful locomotives while they can still move themselves, as their technical state is poor and not getting any better. We have chartered several freight trains on some of the most interesting sections of National Railways of Zimbabwe (NRZ). From Thomson Junction we’ll pass through the one and only tunnel on the NRZ network, swing through the curves along to Lukosi and climb up the gradient to Zanguja. The tour is tailored for the needs of railway photographers and for those who want to see some of the amazing wildlife and scenery. Although this arrangement boosts the price we based the tour on using hotels instead of NRZ-sleeping coaches with its doubtful facilities. The itinerary below does not show every detail. Be assured that everything is arranged in detail. We’ll hand out the detailed plans to the participants about a week before the tour starts. After breakfast, transfer to Dete. We’ll go to the Hwange Safari Lodge close to the entrance to the Hwange National Park. 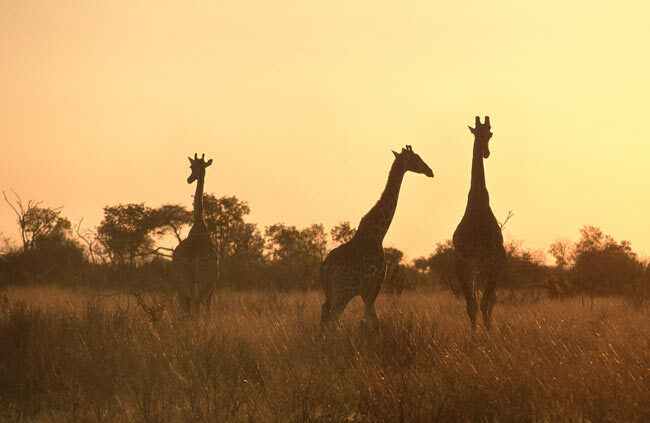 At the lodge you have the opportunity to book one of the offered wild game safari tours. These need to be paid on the spot. About 4.45 am we’ll continue to Thomson Junction, north of Hwange. We’ve planned a tour into the early morning light from Thomson Jn. via Old Hwange. After a lunch break we’ll continue to Lukosi in the afternoon light. From here we’ll roll back downhill to Old Hwange, where our buses will pick us up and bring us to the once famous, recently renovated but still very basic Baobab Hotel. The hotel sits on a big hill and offers a nice view of the railway line, winding around this hill. 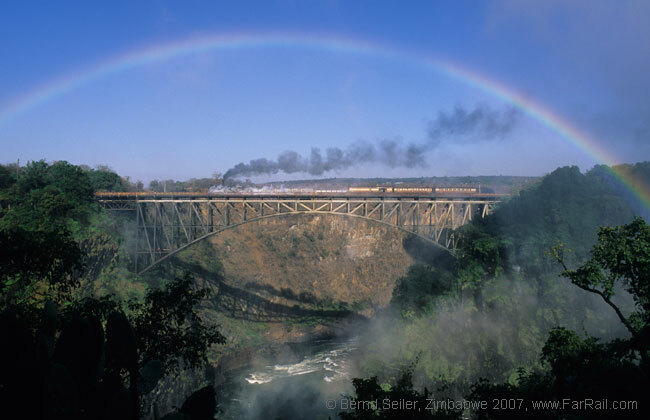 Bridge games … Our train will run several times across the famous bridge over the Victoria Falls gorge. In the afternoon we have no train programme; instead you can do a visit to the national park side and/or book a “sundowner” trip on the Zambezi. Lodge in Victoria Falls. If we have got all the shots we want of the bridge, we will play around Victoria Falls in the morning. If not, we’ll try our luck again to catch the best Garratt/bridge shot. The decision of what and how will be decided the evening before. 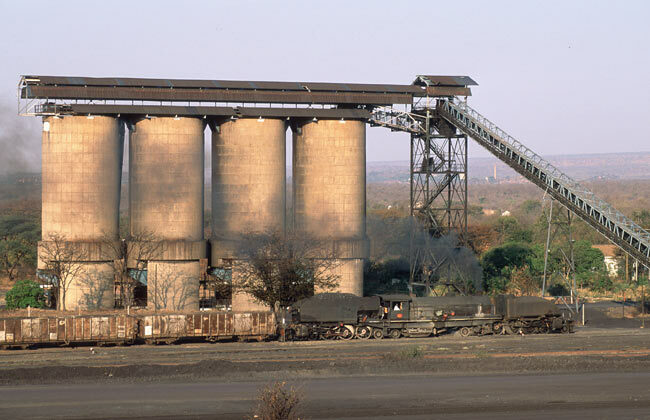 Today we’ll visit the last and only regular steam operation in Africa, at the coal mine at Hwange. 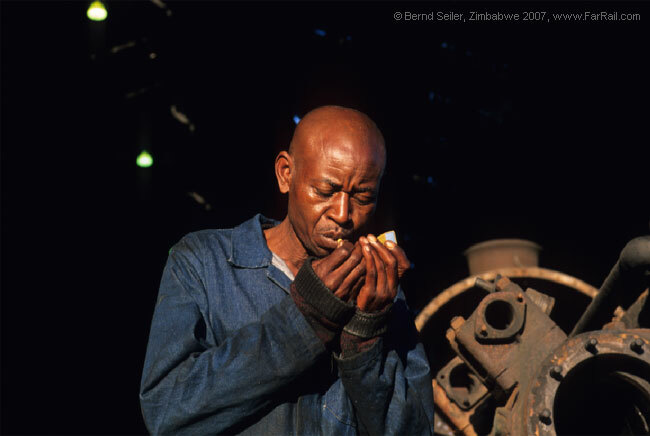 In the afternoon we’ll visit the Garratt of the Hwange colliery. Night photography is planned here as well. Accommodation in the lodge at Victoria Falls. Transfer to the airport and return flight home from Victoria Falls. 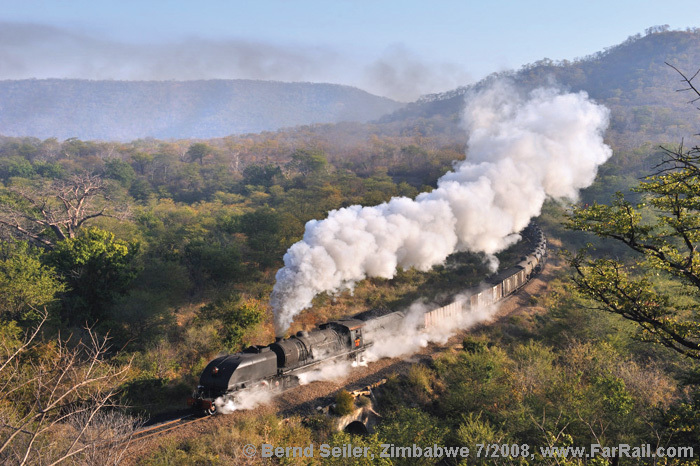 We have arranged a number of charter trains over some of the most scenic sections of the National Railways of Zimbabwe (NRZ). We will try to arrange trains of some 12 to 15 wagons with different freight wagons. We have not attached passenger coaches to these trains as we’re trying to avoid wasting money on non-authentic trains. On most sections we’ll have a diesel locomotive which will haul a passenger coach, service coach for the crew and a water tank wagon, leaving our train with the weak steam locomotive. We’ll travel by these trains. To get the best photographic results, we’ll use the early morning light whenever possible as well as the late afternoon light. We’ll try to avoid the noon light, when the sun is high in the sky, as the results are often disappointing. Usually the state railways are somewhat delayed and we need to expect that our charter trains will be delayed as well (see remarks). 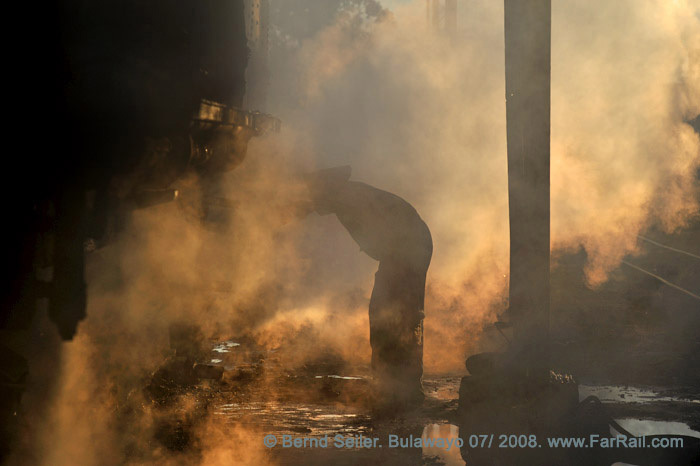 Bulawayo is a medium sized city that in many ways seems unchanged from several decades ago. It is an important crossing of railway lines with a large yard and two loco depots, one for steam and one for diesel. A visit to the amazing large steam depot used to be worth a trip alone! But times have passed by, and most of the formerly proud steam shed is now a shadow of its former self. However, with just one of the mighty Garratts there are still some wonderful photographs possible, especially at dusk. Line service with Garratts was suspended in the mid 1990’s. Shunting operation with steam and short line trips lingered on for about 20 years. There are many Garratts dumped at the shed and all of the steam facilities remain. The line between Thomson Junction and Hwange is not very long, but offers plenty of the best photographic opportunities. 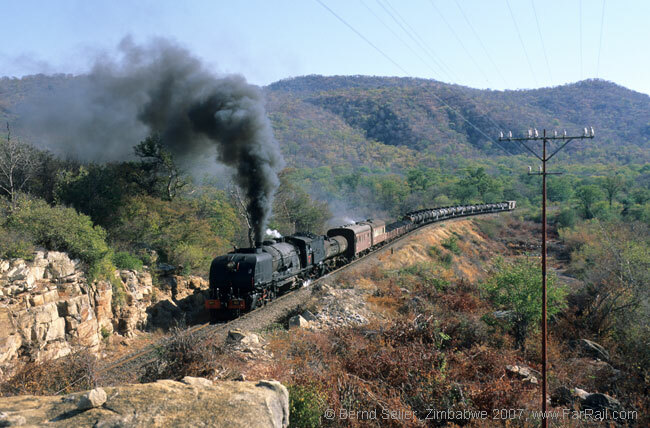 Christine’s curve, the only tunnel on the NRZ and curving around the Baobab hotel hill are some of the best spots. Further on, the line to Lukosi offers many curves including the (now overgrown) famous “404 curve”, baobabs, cuttings and embankments all offer some good positions. We’ll try to change train compositions from day to day as we have ordered different stocks of wagons. 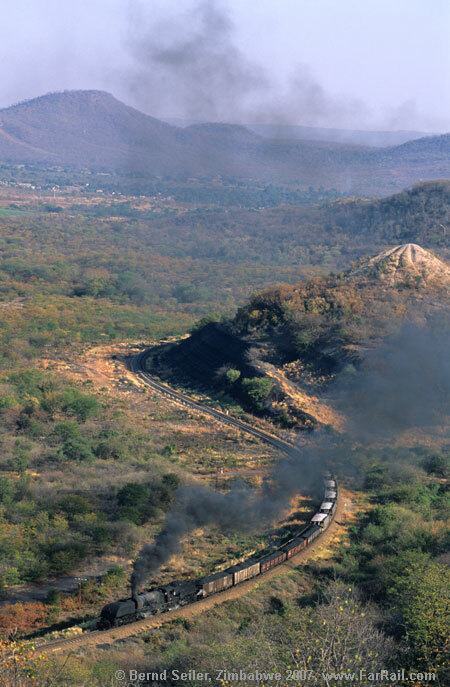 Our train from Thomson Junction to Zanguja will lead us to the famous high embankment on a photogenic S-curve. The climb up to Zanguja is a highlight for sound recorders as well as for photographers and video film makers. 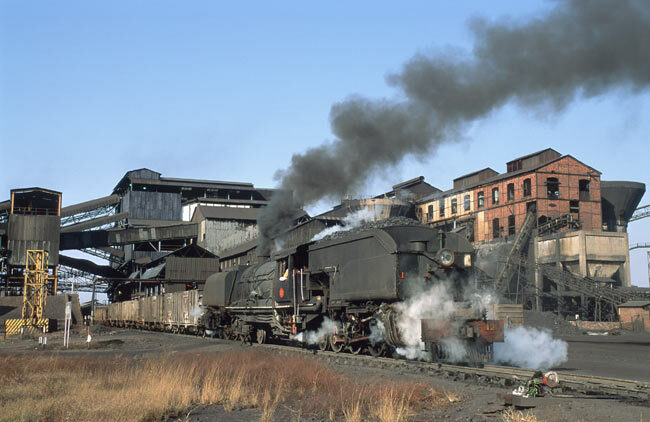 The Hwange Colliery in Hwange (the former Wankie) uses one steam locomotive daily, if not in need of repair. They exclusively use one Garratt, leased from the state railways. The mine railway has an impressive gradient from the state railway station to the washery and there are several good photo opportunities, giving excellent chances for shots of real line work  if there is a train during daylight. The number of trains depends on the production of the mine. We have arranged a visit to the railways of the mine and planned night photography with the mine backdrop, as an impressive industrial scene. Our train over the famous Victoria Falls bridge will run on the impressive century-old, riveted girder arch bridge over the Victoria Falls gorge of the Zambezi River several times to give us opportunities for taking pictures from different angles. 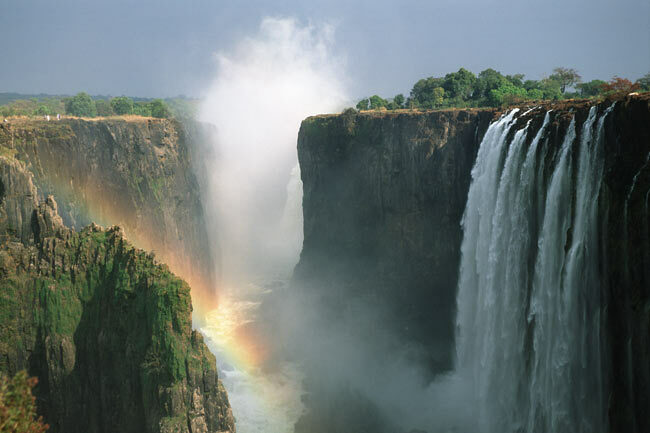 The rainbow, shown here in a picture, is only above the bridge in the early morning light if there is sufficient water in the Zambezi river and hence sufficient spray in the air. The border between Zimbabwe and Zambia is in the middle of the bridge. It’s also possible to charter a helicopter to capture the train and water falls in the same scene. We can charter a helicopter for about £150 per person. If you wish to take a shot from above, we’ll arrange everything. The price for the round trip flight of about 20 minutes is not included in the tour price and the arrangement with the helicopter has to be made two days in advance. Even with tight planning it is somewhat difficult to be at just the right position when the train is on the bridge, so we can’t guarantee you an air photo with the train on the bridge at the perfect location, but it is fun to try and everyone will do their best to help make it possible. If you wish to visit the falls from the Zambian side you’ll need a visa which is issued and paid for at the border. 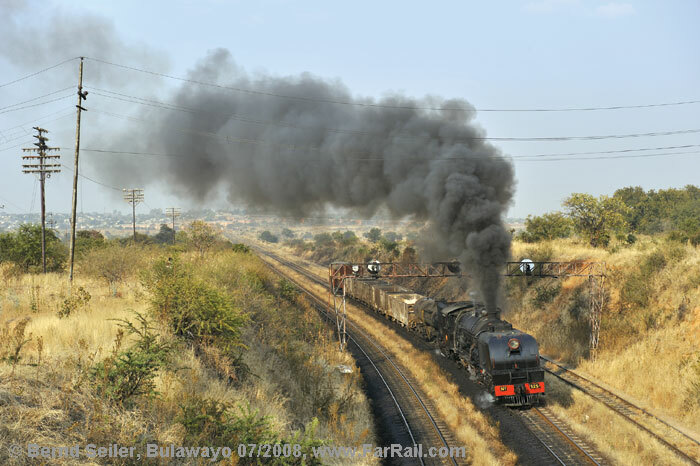 The best train shots can be taken from three sides, two from Zimbabwe, one from the Zambian side. 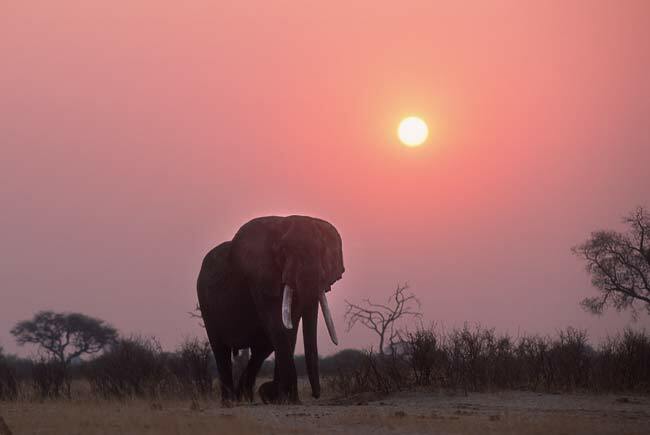 The amazing African wildlife alone is a reason to visit Zimbabwe. You’ll have the opportunity to visit two of the outstanding National Parks with the most animals and a variety of natural habitats. At the water holes you can probably watch elephants, hippos, rhinos, crocodiles, giraffes, zebras, monkeys, a variety of birds and more. They have installed some viewing towers from which you can take photographs or just contemplate the vastness of Africa and the diversity of its wildlife. You can book a local guide who will guide you through the park and will know the best spots for meeting animals. As this is an expensive option, here is another one: the more relaxed version is to watch animals at a large water hole from the terrace of our comfortable hotel. While this latter version is free of (extra) charge, travelling to the park requires an ever increasing fee. This fee is growing unpredictably and, so, could not be included in the tour price. Also, we wanted to make the tour as affordable as possible (I know, it’s expensive already). If you are interested and can afford it, we strongly recommend adding a few days to the itinerary and spending some more relaxed time in and around the Victoria Falls Park, the Hwange National Park and, maybe, even the park with Cecil Rhodes’ grave to the west of Bulawayo. You can also charter a car and do it comfortably and for a reasonably good price. Please tell us your preference with your registration and we’ll arrange everything for you in advance. Victoria Falls National Park offers fantastic water cascades, rainbows, tropical vegetation and a large variety of birds. It’s easy to walk alongside the waterfalls on sign posted paths that feature amazing views and beautiful tropical vegetation. You should take care that your camera batteries are fully charged when going inside the national park as there are so many exiting photographic possibilities. In the evening we’ve planned a special event on the Zambezi River for you. Don’t forget to bring along some reading about African exploration and history, because this is really a chance to enjoy books about Burton, Speke, Rhodes, Livingstone and Stanley and many others, not to mention the construction of the railways. For something a little more relaxing, copies of Alexander McCall-Smith’s books set in Botswana about “The No.1 Ladies’ Detective Agency” are a must ! There are also several excellent books available on Zimbabwe Railways and its locomotives. Photography opportunities in Zimbabwe are boundless, and everyone should get excellent photos or video on the trip, despite the difficulties and technical hurdles. We will have the necessary permits and the people are friendly and receptive to photography. Be sure to bring lots of memory cards or films if you are an “honest photographer” or a “dinosaur of photography”. A tripod is especially useful for wildlife photography with extreme long lenses. We’ll probably see three different Garratts on the tour. 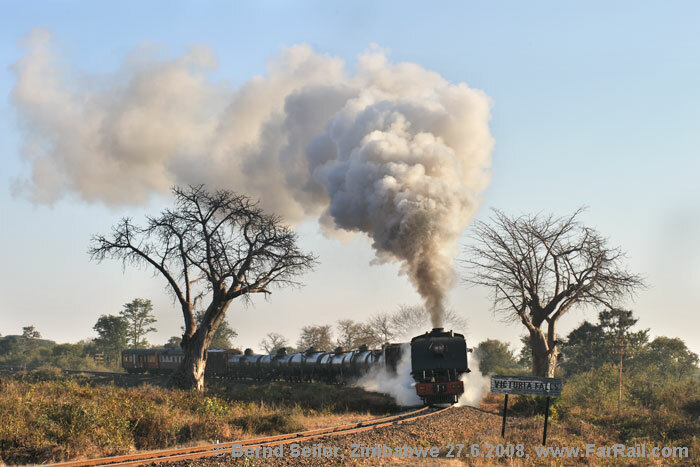 A couple of years ago NRZ started, but never completed, a programme to overhaul at least ten Garratts for regular use and Safari charter trains. Hence, the technical shape of the locomotives is not at its best. 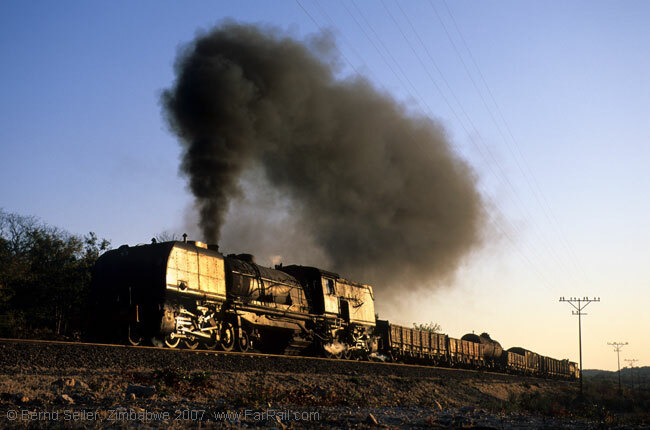 The valve and piston glands might be seriously leaking which will cause trouble for those who want to record the sound of a locomotive as well as for photographers in the chilly mornings. For a good reason, we’ll add a diesel locomotive to most of our trains, as we did in 2007 for the first time. The diesel will be taken off for runpasts, of course. Despite some reports in the western press, we as tourists will find a peaceful country with very friendly and helpful people who will do everything possible to make our stay an enjoyable one. The crime rate is low, and food and beverages are easily available. The people of Zimbabwe harbour no resentments towards white visitors at all. So you can feel relaxed and enjoy what you see. Most people speak some English, and many are fluent, and they are usually pleased to talk with visitors. The selected hotels in Zimbabwe offer a solid basic standard but are expensive compared to European equivalents. Although many people are very poor, beggars are almost unknown. Please remember that any disapproving statements regarding Robert Mugabe or criticisms of the regime must be avoided after your arrival in Zimbabwe. Our visit will help support the National Railways and its efforts at steam operation and it will contribute to the steam development programme. Of course, there are some difficulties caused by the dire economic situation. It improved a lot when the US-Dollar became the currency in use, but the limited access to the US-Dollar can cause unpaid wages and, as a result, strikes. Please note, that we cannot guarantee anything beyond our control. It’s not possible to guarantee a specific locomotive or train composition. It’s not even possible to guarantee that all our planned activities can be executed as planned. Heavy delays for various reasons are not uncommon and can lead to cancellation of trains. We must admit that the Garratts are basically overhauled for shunting duties or not at all for many years and it’s almost a miracle that they have performed so well on our recent tours. But when you take a close look to the technical condition you’ll agree that nothing can be guaranteed. The visa for Zimbabwe will be issued at the airport on arrival. There is no Zimbabwean double entry visa requirement for a day trip to Zambia. However, you do need a visa for Zambia (issued at the border). The visa fee is not included in the tour price as there are differences depending on your nationality. In Hwange and Victoria Falls, there is a small to medium risk of Malaria. Please take either a Malaria prophylaxis or use a mosquito net and long clothes in the evening. At the moment there are no rules for special vaccinations. Our travel in the dry season makes the risk quite small, but it pays to be safe. For money it is recommended that you take US-Dollars. Inflation was a major problem for the previously used local currency, the Zimbabwe Dollar. Nowadays they accept US-Dollars and sometimes South African Rands. Please read the recent trip reports to get an idea about the country and its railway. You’ll need US-Dollars to pay the visa on arrival, entrance fees and food/beverages. Despite some power cuts we’ve had no problems recharging batteries on our previous tours. Our hotels use generators in a case of a power cut. We expect temperatures between about twelve degrees Centigrade (in the early morning) and 30 degrees Centigrade (only in Vic Falls, Bulawayo is rarely above 27 degrees Centigrade at this time of the year). Normally it’s dry and sunny and very pleasant. We guarantee that we’ll do everything possible to make the most out of the tour; to make it enjoyable and successful in all respects. We’ll offer as many photo and video opportunities as possible. Booking this tour requires that you fully agree to the following: we, FarRail Tours, can not be held responsible in case of any delay, train cancellation or short supply of coal, electricity, water etc. 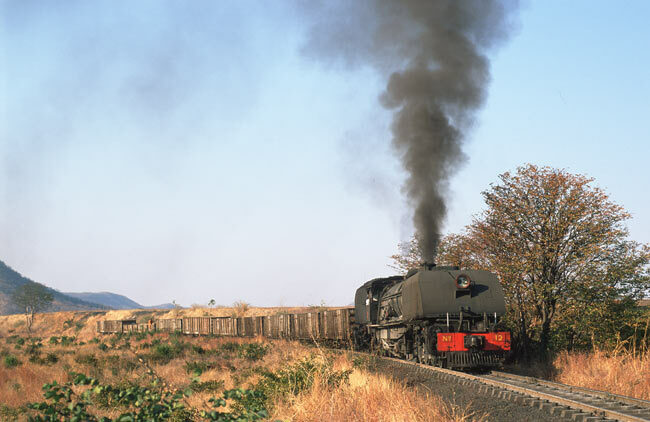 No refunds can be claimed against NRZ or FarRail Tours in case of delays, cancellations, train compositions which don’t meet your expectations, supply problems of any kind and so on. In short: times, trains, locomotives, lines etc can not be guaranteed. The reason for this warning is not that we, FarRail Tours, do not have the contacts, offend railway people or are unable to make proper arrangements. We faced sabotage on one of our earlier tours from (European) people who are still active. Everyone in Zimbabwe who is involved promise us they will work together with us and not against us. 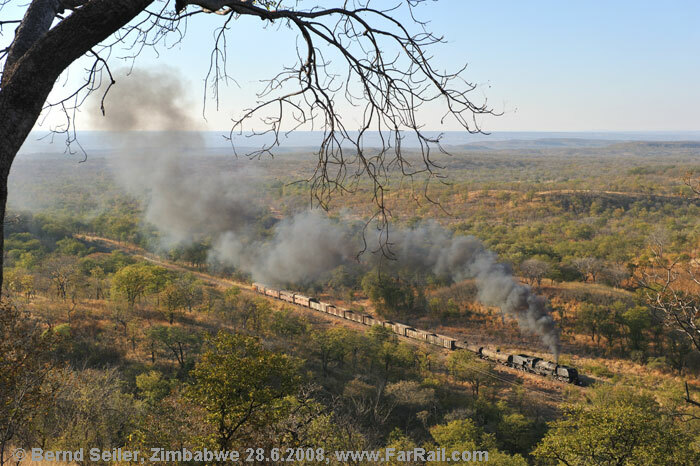 It was the wish of many frequent FarRail Travellers that I should offer a tour to Zimbabwe again. I don’t want to draw a black picture here, but I know the country and its challenges too well to tell you everything is just fantastic. You need to understand that we’ll visit a country with economic and political problems and where the mentality of the people, and the culture, is quite different from European, North American and Australian ideas and ways of doing things. If that were not the case we wouldn’t have any chance to see these fascinating locomotives and authentic trains on a railway which obviously hasn’t changed its appearance for decades. A tour like the one we are offering would not have been possible at this (still reasonable if you consider the sharp decline of the British Pound) price, that is for sure. If we had included insurance against all possible contingencies which might happen, the tour price would need to be tripled. The only way to approach this fascinating country with its mighty Garratts in front of real looking trains is to accept the opportunity of changes or even failures. However, the economic situation is much better now compared to the years when inflation ruined the economy. But even under the worst of the worst conditions and including the fact that people wanted to sabotage our tour, we still got excellent results. Taking part in this tour is a risk well worth taking as the participants on our earlier trips discovered. If you can accept all this - welcome to Zimbabwe! Environmental standards in Zimbabwe do not conform to Central European, Australian or North American expectations. However, it’s prohibited to cut trees and bushes. Carrying some toiletries in your photo bag is also advisable. Please bear in mind that accommodation and transportation in Zimbabwe falls short of EU/US safety standards. Always use common sense when crossing roads and railway tracks. Neither FarRail Tours nor NRZ can be held responsible and will not accept any liability whatsoever in the case of any accident, delay or damage. We suggest you take out a comprehensive overseas accident and health insurance policy. If required, you can book a full board package including packed meals on thee trains and dinner in our hotels for 350 US-Dollars. This includes one bottle of beer or one glass of wine per dinner. “Tips“ for local authorities, staff etc. (please calculate with some £100).